PI166. 2 circular official identity discs engraved A3528 J. K. PHILLIPS R.A.A.F. P 04. PI172. 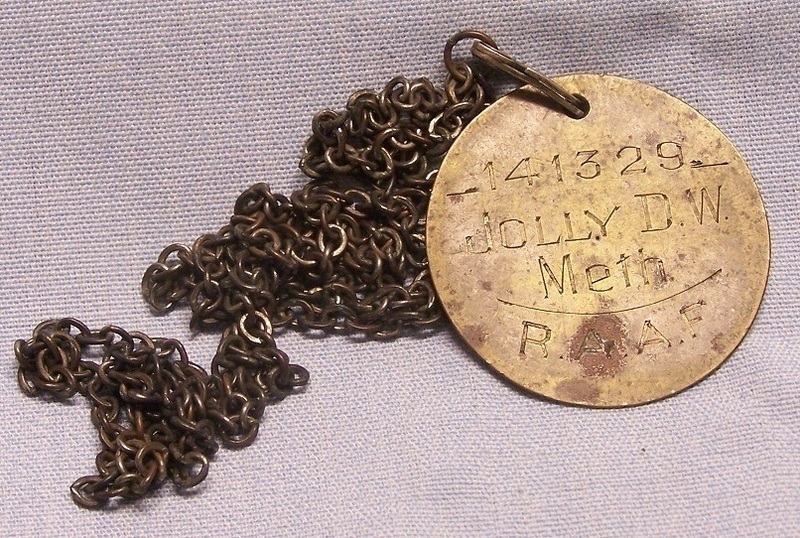 A single unofficial identification disc engraved 41329 JOLLY D. W. Meth R.A.A.F. 04. David William Jolly enlisted on 5 Oct 1943 at Adelaide and discharged on 23 Jan 1946 as a Leading Aircraftman from 1 Stores Depot. PI180. A pair of official identity discs engraved 26501 Cushway W J S RAAF C of E 0(4) also attached is a small carved figure. William James Samuel Cushway enlisted on14 May 1940 at mount Gambier and discharged on 23 Mar 1949 as a Corporal from Aircraft Research and Development Unit. PI182. 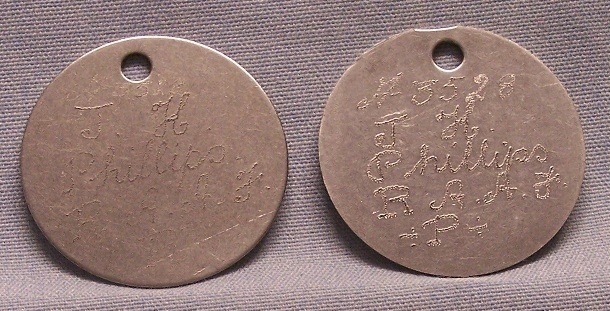 A pair of official identity discs engraved A325168 HICKMOTT. K. RAAF ANG’N A+. PI186. 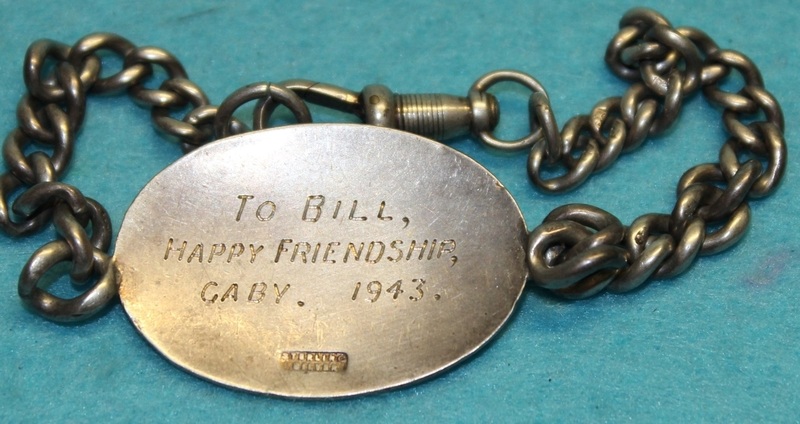 A small oval sterling silver identification bracelet engraved W. J. SANDERCOCK 417420 R.A.A.F. on the back is TO BILL HAPPY FRIENDSHIP. GABY. 1943. William James Sandercock enlisted on 25 Apr 1942 at Adelaide and discharged on 11 Jan 1945 as a Warrant Officer from 279 Squadron. PI186. A small oval sterling silver identification bracelet engraved W. J. SANDERCOCK 417420 R.A.A.F. on the back is TO BILL HAPPY FRIENDSHIP. GABY. 1943. PI191. 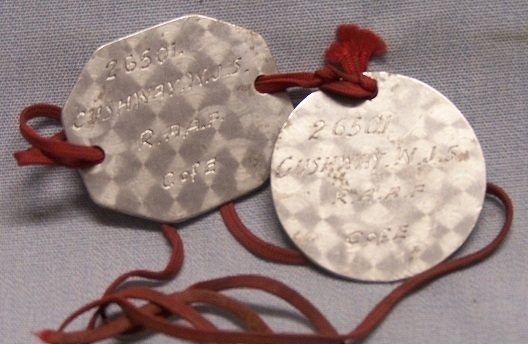 A pair of official identity discs engraved A25668 FREEMAN, N. S. R.A.A.F. C of E 04. PI195. A Stirling silver identification bracelet engraved 90688 C St B Foster WAAAF CE 04. Cora St Barbe Foster enlisted on 23 Jan 1942 and discharged on 20 Nov 1945 as a Corporal from 1 Stores Depot. PI212. A pair of unofficial identity discs engraved 26501 CUSHWAY. W. J. S. R.A.A.F. C of E 01V. William James Samuel Cushway enlisted on14 May 1940 at mount Gambier and discharged on 23 Mar 1949 as a Corporal from Aircraft Research and Development Unit. PI213. 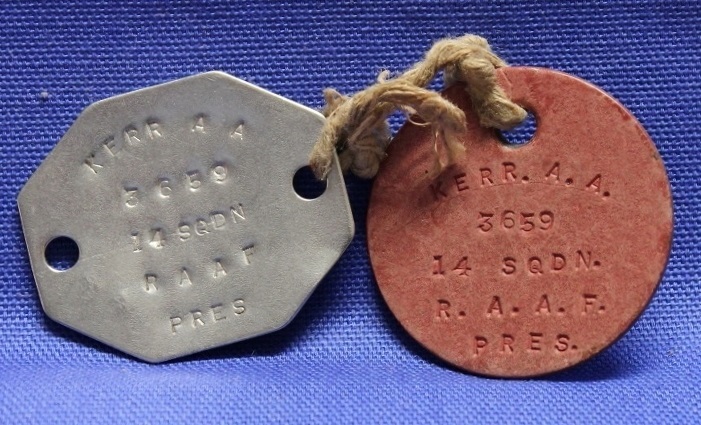 A pair of official identity discs stamped HENDERSON A 9053 RAAF C E 04. Ashley Robert Clyde Henderson enlisted on 13 Feb 1940 at Laverton and discharged on 21 Nov 1945 as a Sergeant from 2 Flying Boat Repair Depot. PI214. A pair of unofficial identity discs engraved 402194 ADSETT. R. W. RAAF C of E AB1. Reginald William Adsett enlisted on 24 Jun 1940 at Sydney and discharged on 16 Apr 1947 as a Flight Lieutenant from Eastern Area Headquarters. PI218. 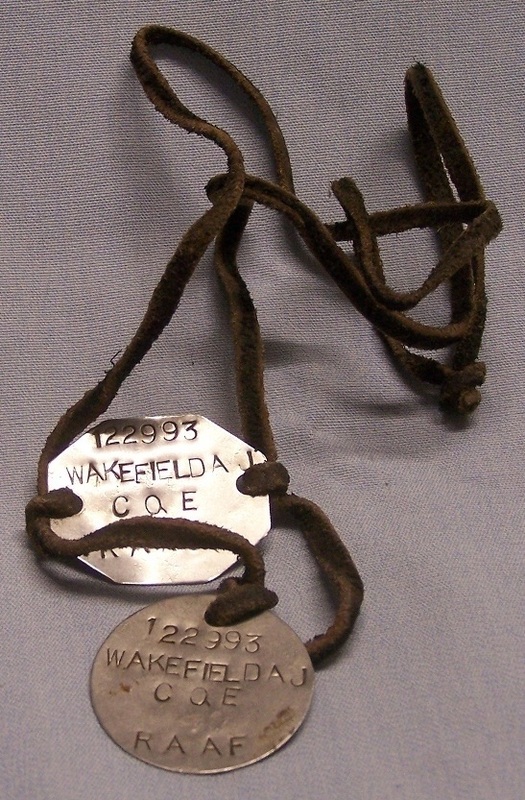 A pair of official identity discs stamped 122993 WAKEFIELD A J COE RAAF 04. Arnold John Wakefield enlisted on 8 Apr 1943 at Adelaide and discharged on 29 Jan 1946 as a Leading Aircraftman from Gawler Telecommunications Unit. PI219. 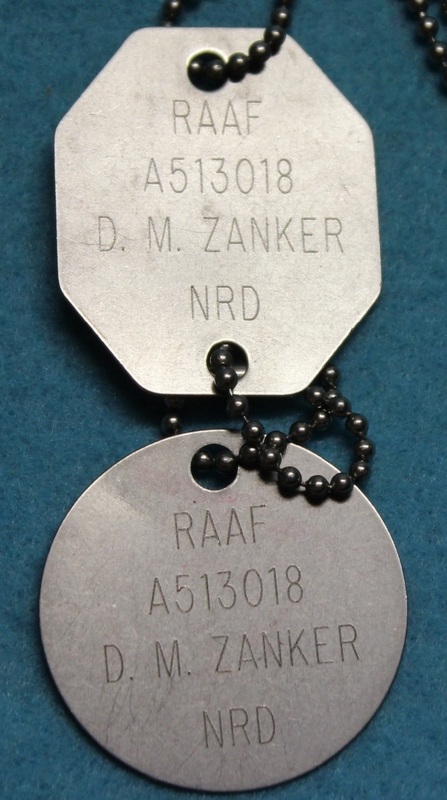 A pair of official identity discs engraved RAAF A513018 D. M. ZANKER NRC B NEG. PI224. 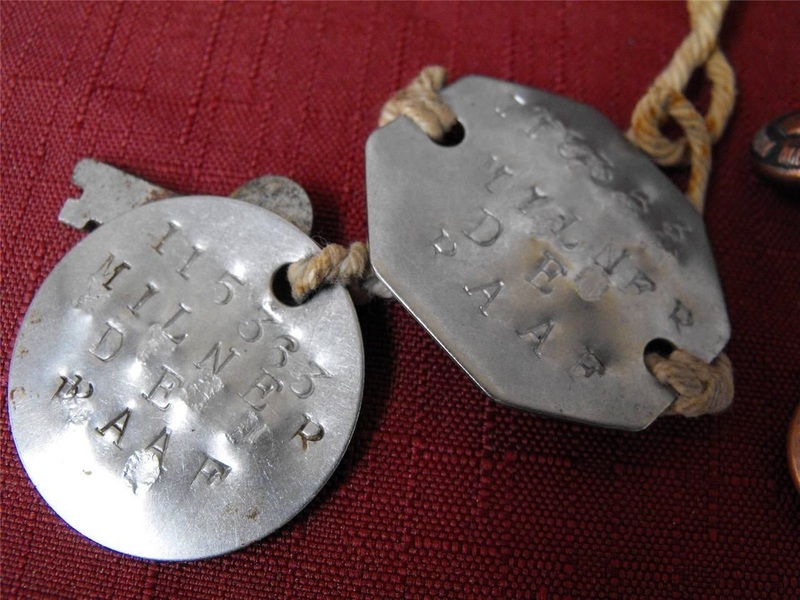 A pair of official identity discs engraved 116670 CROAD W S W R.A.A.F. Pres 04. William Stanley Welland Croad enlisted on 6 Aug 1942 at Melbourne and discharged on 9 Aug 1946 as a Leading Aircraftman from 6 Service Flying Training School Mallala. PI225. 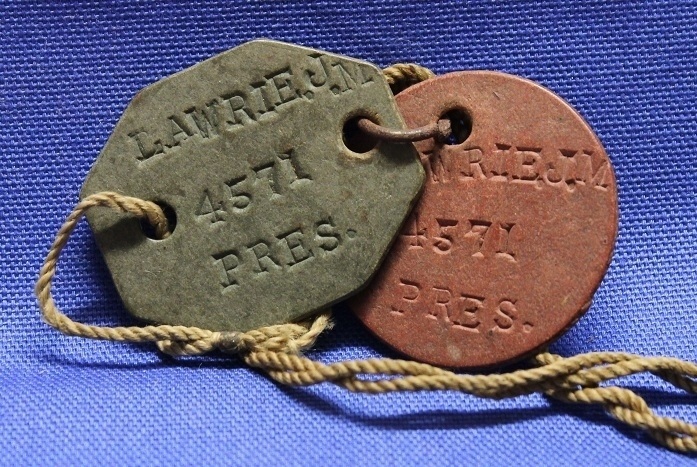 A pair of official fibre identity discs stamped LAWRIE J. M. 4571 PRES. James McDougall Lawrie enlisted on 3 Jul 1939 at Laverton and discharged on 17 Jul 1946 as a Warrant Officer from the Air and Ground Radio School. PI226. 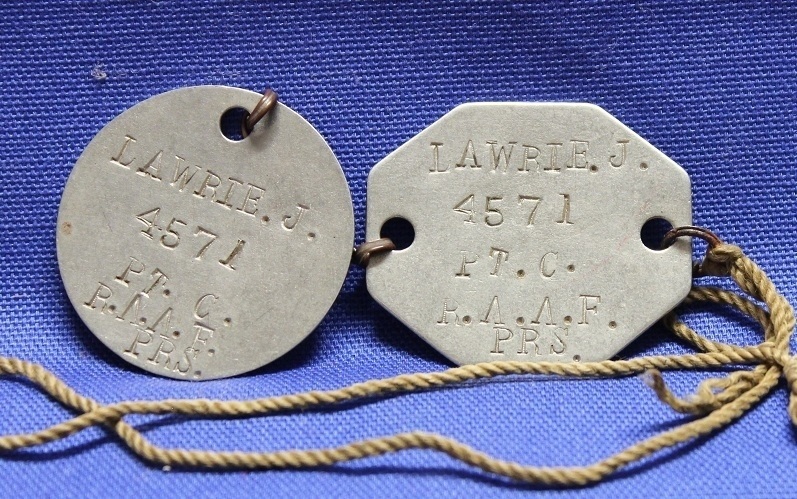 A pair of official identity discs stamped LAWRIE J. 4571 PT. C. R.A.A.F. PRS. 04. James McDougall Lawrie enlisted on 3 Jul 1939 at Laverton and discharged on 17 Jul 1946 as a Warrant Officer from the Air and Ground Radio School. PI228. 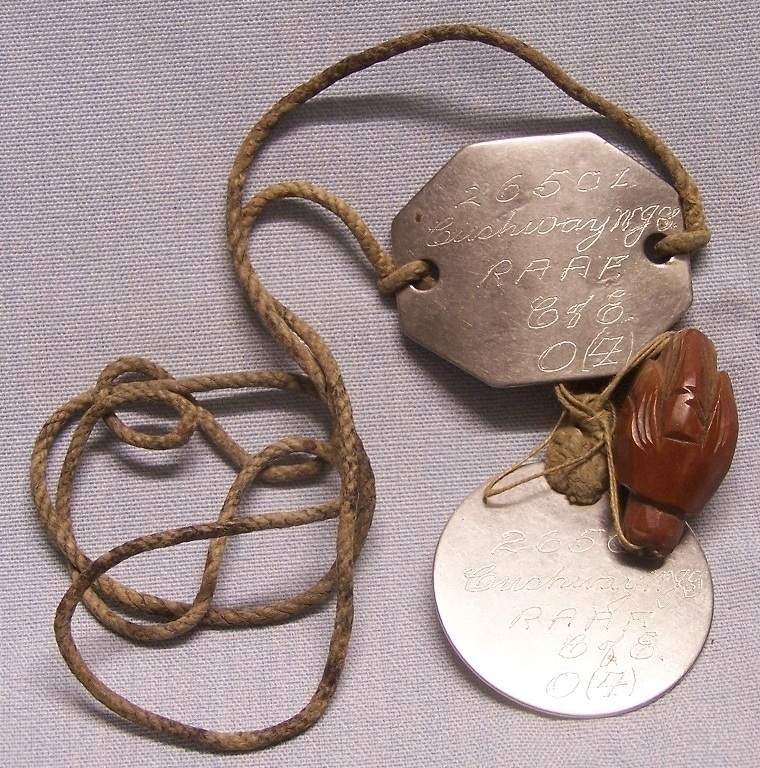 A pair of official identity discs, 1 fibre and 1 metal, stamped KERR A. A 3659 14 SQDN R.A.A.F. PRES A2. Allan Arthur Kerr enlisted on 15 Aug 1938 at Laverton and discharged on 21 Feb 1946 as a Warrant Officer from 1 Personnel Depot. PI233. 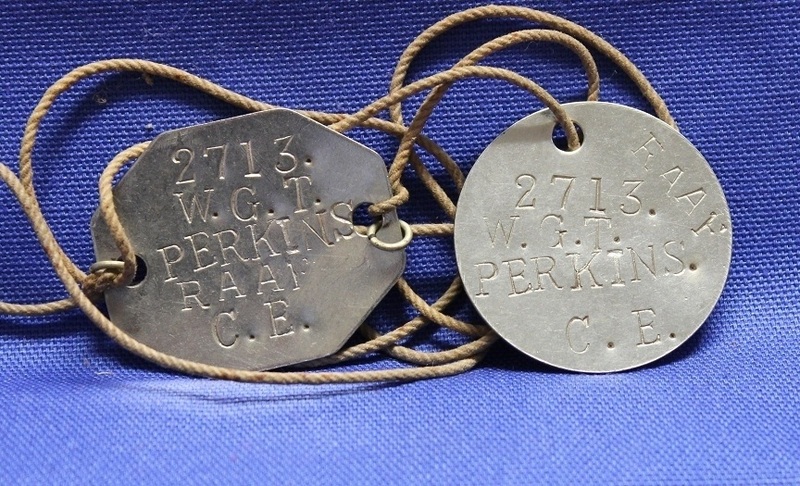 A pair of official identity discs stamped 2713 W. G. T. PERKINS RAAF C. E. 04. William Godfrey Perkins enlisted on 8 Mar 1937 at Richmond and discharged on 10 Jul 1946 as a Leading Aircraftman from 2 Medical Rehabilitation Unit. PI235. 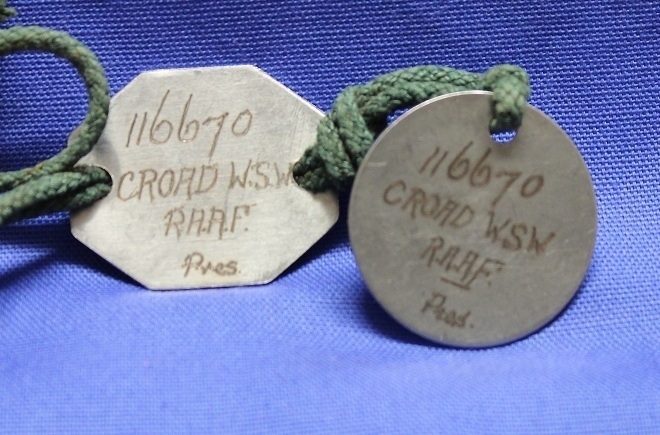 A pair of official identity discs stamped 115363 MILNER D. E. RAAF 04. Also attached is a small key. Dudley Edwin Milner enlisted on 30 Jul 1942 at Adelaide and discharged on 26 Mar 1945 as a Leading Aircraftman from 4 School of Technical Training. PI236. 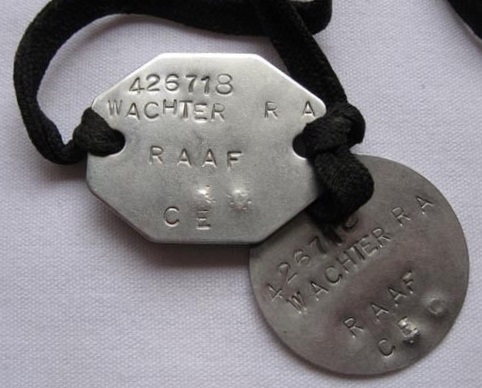 A pair of official identity discs stamped 426718 WATCHER R A RAAF CE 04. Ronald Andrew Watcher enlisted on 18 Jul 1942 at Brisbane and discharged on 11 Sep 1945 as a Warrant Officer from 29 Operational Training Unit. PI240. 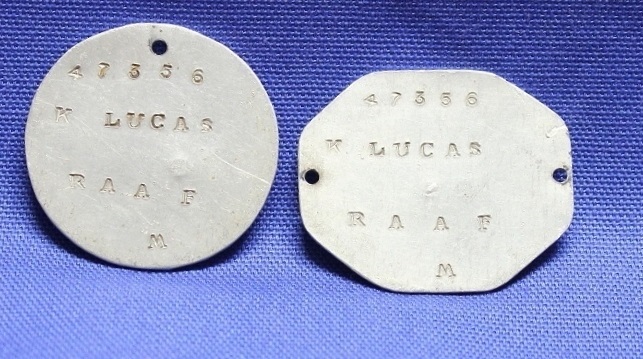 A pair of unofficial aluminium identity discs stamped 47356 K LUCAS RAAF M 04. Kenneth George Lucas enlisted on 30 Dec 1941 at Adelaide and discharged on 28 Mar 1946 as a Leading Aircraftman from Care & Maintenance Unit Tocumwal.